Do you feel that? The numbing pain left behind when a small piece of your soul has been extracted and crushed, never to return to your body again? If not, then perhaps you don’t have any soul left to crush. Understandable. There was so much hoonage left with that one. It could have done big things. Take a moment here, as you’re probably clutching your chest in an episode that feels like some serious heartburn. That’s your soul again, busting its way out of your body and leaving you even more empty than before. 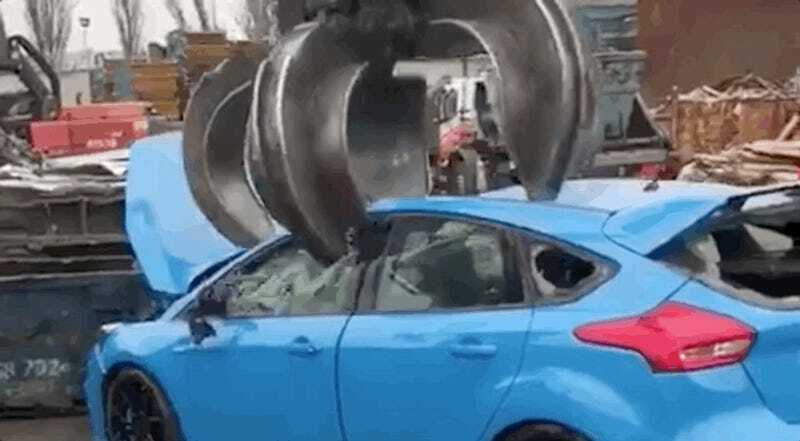 That poor Focus RS didn’t deserve this. Why would anyone allow this kind of horror to occur? There’s actually a fairly common reason for it. As Road & Track pointed out after seeing the plates, this unfortunate Focus RS and the equally-as-unfortunate Focus ST behind it were, in their short lifetimes, probably pre-production cars. Some pre-production cars lack certain equipment to make them road legal, and others have been thrown into tons of endurance and reliability tests. While Autoweek reports that a lot of automakers donate some of their unsellable pre-production cars to engineering programs at universities, other cars aren’t so lucky—they get crushed harder than the souls of, well, all of us watching. Good luck in this cold, cruel world that crushes good cars instead of giving them another chance at life. You’re probably better off without a soul anyway.